Our partner school AGS (Anden Global Studies) is located in the heart of the new town, in the north area of Quito, in a quiet and safe residential area called “El Batán”. This location is few steps away from main avenues and public transportation (Ecovía) and close to parks, shopping centers, restaurants, banks, embassies, and supermarkets. Our partner school offers a comfortable infrastructure nicely decorated with areas in which you can relax and share with other students. AGS has 9 teaching classrooms, video room, Wi-Fi, internet area with computers, multiple use room, ping pong area, garden, terrace and cafeteria with purified water, coffee and tea. Our partner school offers an adequate combination of a personalized service in a professional but warm environment with a wide variety of academic programs and extracurricular activities; all of which allows us to meet the needs of our students in an personalized way. Climbing Cotopaxi or Cayambe volcanoes. This course consists of 20 lessons per week starting every Monday all year round. You will be in a group with a maximum of five students. On the first day you will take a placement test and according to the test you will be placed in one of the eight levels this program has. The price mentioned here is for an airport transfer on arrival at airport Quito. 2019 the school will be closed on: 01/01/2019, 04/03/2019, 05/03/2019, 19/04/2019, 01/05/2019, 24/05/2019, 11/10/2019, 01/11/2019, 06/12/2019, 25/12/2019. Lessons missed due to bank holidays will be rescheduled. When there are two holidays in the same week, the school will only close on one of these days and the lessons missed due to the second holiday will not be rescheduled. The combined course is specially designed for those participants who would like to study in a group, yet at the same time have some private lessons for their professional or personal needs. This course consists of 20 group lessons per week + 5 private lessons per week (1 lesson = 50 minutes). The most effective method for learning a foreign language is a total cultural immersion. Quito, a crossroads of indigenous, colonial and modern influences, is an ideal location for this. With this course you will have 20 Spanish group lessons with an experienced professor during the mornings and you will explore the city with your teacher in the afternoon (15 lessons per week). 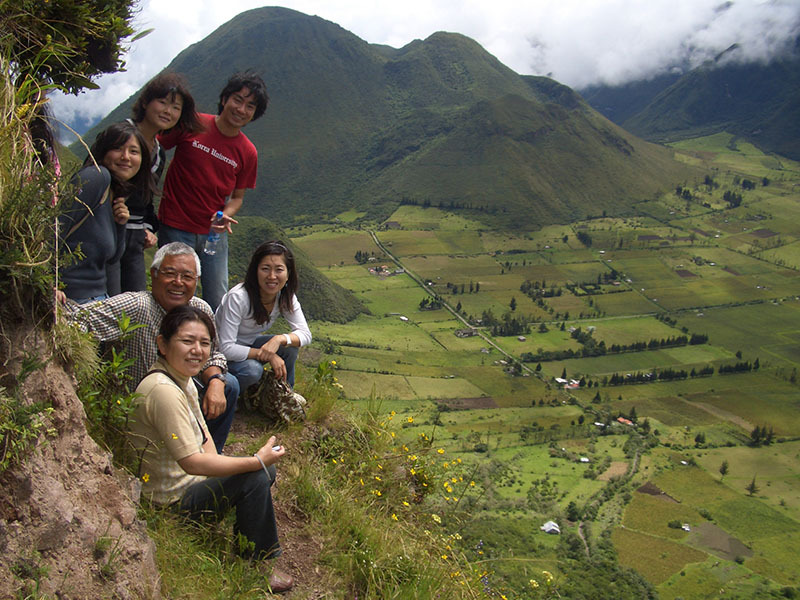 The Spanish & Culture course combines formal but dynamic classes with cultural and tourist excursions in Quito and surroundings. The price includes entrance fees for museums, churches and other places of tourist interest, as well as the public transportation inside and around the city. The medical Spanish course is available for students and professionals in the medical field with a minimum elementary level of Spanish. This special course combines half day Spanish lessons for 2, 3 or 4 weeks (20 Spanish lessons per week) and half day observational rotations for students and professionals in the medical field rotations accompanying doctors or residents in hospitals and clinics in Quito for 2 weeks. After evaluating your language skills level, the language professor tailors an individual program according to your needs and determines when you can start with the clinic observational rotations. For professionals, application requirement includes proof of medical license (or CV) and in the case of students, a document from medical school or current transcript of medical education. The hospital/clinics are at an average distance of 30 minutes from school. Transportation costs are not included. The 3 and 4 weeks course can include 10 additional hours of medical Spanish group instruction for additional € 111 per week. This course consists of 20 private lessons per week, you can start every Monday. It is specially designed to meet your needs according to your level of knowledge, your particular and professional interest, and your own pace to learn. You can request specific exercises and specific focus of the lessons but the course structure is more or less the same as the mini group course: half of the course is formal class instruction and the other half is practical activities and exercises. Our partner school in Quito offers a wide programme of volunteer opportunities in several areas such as: social work, educational or environmental projects in the most respected humanitarian and ecological organizations. This program gives you the opportunity to volunteer during your Spanish course. Participation depends on your language level and the minimum skills required for the desired project. (1) Some of the organizations’ projects have a registration fee that is not included in the program price. (2) The volunteer work projects are at a minimum of 15 minutes and maximum 60 minutes of distance from school. Expenses of transportation are not included. The JobTravel programme requires a minimum level of elementary and a minimum age of 18. The family homestay option is intended for those students who want to maximize their learning—not only in terms of Spanish, but also Ecuadorian culture—by sharing in the daily life of a local family. All AGS host families are carefully selected to provide the support and comfort necessary for a pleasant and enriching stay. Each student will always have his/her own private room and will share bathroom facilities with the family. Breakfast or half board, plus weekly laundry service, is included in this option.